Revenge stories are an old and well-established form, but that doesn’t make them any less gratifying. From The Count of Monte Cristo to Sweeney Todd to RoboCop, the thrill of watching a wronged hero deliver justice is one of my favorite kinds of entertainment. Dishonored falls in step with those notable examples as Corvo Attano hunts those who betrayed him, and the array of choices at players’ fingertips makes it a pleasure to be the architect of his retribution. Dishonored blends aspects of acclaimed games like Deus Ex, Thief, and BioShock to create a world where players are free to decide how to complete their objectives. Games have made this promise for years, but Dishonored comes closer to keeping it than anything else I’ve seen. You aren’t just presented with different paths geared toward specific character builds; each level is a web of connected encounters that allow you to mix your magic abilities, fighting prowess, and stealth in clever ways. For example, getting past a security checkpoint might involve open combat, rewiring the security system, using Stop Time to sneak past, or a combination of those and other options. However, getting past the security checkpoint is just one step toward your goal, so you also need to be mindful of where your choices lead. Killing six guards might seem like you blew it at the time, but when the streets there were patrolling are empty, it doesn’t look so bad. Seeing this snowball effect as you work your way through your missions is one of Dishonored’s major payoffs. The level design accommodates the various options well, and makes each new area feel like a puzzle that needs solving. Unfortunately, success is rarely as simple as conceiving of your solution and devising it. Enemies’ ability to detect you is wildly inconsistent, leading to fuzzy stealth mechanics that aren’t predictable enough to be reliable (even with a cool power that shows enemy vision cones and silhouettes behind walls). This presents problems in any situation, but is especially galling if you’re stealth-focused, since you’re less prepared to deal with the onslaught of guards that swarm you upon detection. As I tried to finish a level with no kills, I would often attempt a particular strategy three or four times before it worked as intended. If you want to take a pure stealth approach, you should save your progress often and expect to reload frequently. If you don’t care about racking up a body count, mixing aggression with deadly stealth is by far the most entertaining way to play Dishonored. Corvo’s powers and equipment can be combined to great effect. Effective strategies include freezing time and placing a springrazor trap in the midst of a group of guards, rewiring an arc pylon (basically a weaponized Tesla coil) so it vaporizes nearby foes, and stabbing guards in the neck only to watch their bodies dissolve into ash before they hit the ground. If nothing else, you can just use your gun and sword to mow through foes in cool straight-up fights. Experimenting with your arsenal isn’t always about finding your way around a problem; sometimes it’s just pure fun to mess with bad guys and see what happens. Murdering guards and assassinating targets raises the level of chaos in the plague-stricken city of Dunwall, while finding nonlethal solutions decreases chaos. Chaos only has two values – low and high – but managing it is never adequately explained. How many people can you kill before chaos rises? If you stab a wolfhound, does that count as a kill? What about deaths resulting from rewired traps? You have to wait until the post-mission stats to find out what effect your actions had, which makes it difficult to extract answers. This mechanic is problematic because your cumulative chaos value determines which of the two endings you receive. 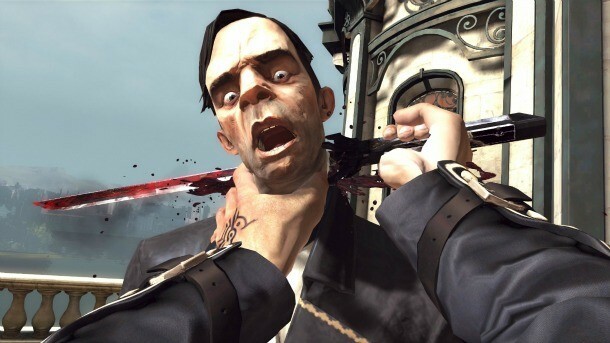 For all of Dishonored’s attempts to avoid the traditional morality found in choice-driven gameplay, you’re still making a binary choice: Will you kill people, or not kill people? The latter option leads to the satisfying ending, while the former results in a punitive conclusion. This divide establishes a right and wrong way to play; high chaos makes the game harder, adding more plague rats, infected citizens, patrols, and even a more difficult alternate version of the final level. 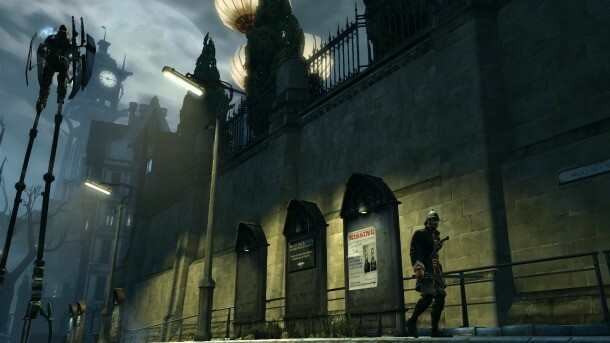 However, playing this “wrong way” is the mix of sneaking and assassination that makes Dishonored shine. If you want to see the good ending (and avoid being punished for playing the game at its best), you must forsake the multitude of cool death-dealing contraptions and upgrades in favor of the comparatively sparse offering of nonlethal alternatives – which doesn't help endorse low-chaos stealth as a valid style of play. Maybe I wouldn’t care so much about getting the bad ending if I didn’t love Dunwall so much. Corvo may be the protagonist, but the city steals the show as a grimy, industrial backdrop for the action – and I didn’t want to see it devastated at the end. The steampunk-inspired technology is fascinating, and the art direction superbly establishes a distinct visual style to accompany the dark and disturbing lore lurking behind the city. I hope this isn’t the last time I play a game set in Dunwall. Though I was frustrated by the chaos system and how it steers your actions, the heart of Dishonored is about being inventive, adaptable, and ruthless. The team at Arkane Studios has injected an array of cool possibilities into the simulated city of Dunwall, and discovering them all is a blast. When you come face-to-face with the people who wronged you, your only dilemma is deciding which poetic method of elimination will produce coolest result. The console versions of Dishonored have more graphical hiccups like framerate issues and screen tearing (especially on PS3). The textures look a little muddy no matter how you play, but go for PC if you have the option. 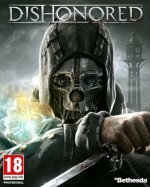 Dishonored falls in step with classic revenge tales as Corvo Attano hunts those who betrayed him, and the array of choices at players’ fingertips makes it a pleasure to be the architect of his retribution. Playability Everything feels natural for all of the different powers, weapons, and options. You even get a lean function!